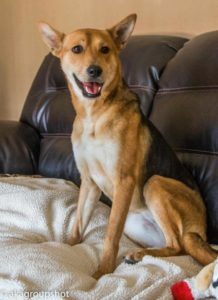 Kooper has been in her forever home since March 2019. Kooper came from the county shelter. 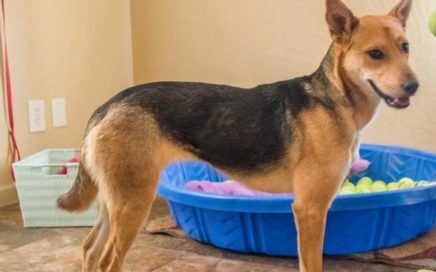 She was picked up and quickly adopted out, but a week later, she was picked up as a stray again and her original adopters didn’t want her back. Along came the next couple who adopter her, but after struggling to keep her weight up and food in her system, she was returned to the county shelter with a diagnosis of megaesophagus from their vet. Her weight loss was substantial and when she came to SPR, she was a mere 18 pounds. Volunteers at SPR spent many months figuring out the best combination of foods and routine to help her gain weight. With megaesophagus, the dog’s esophagus is either enlarged or has pockets where food will stick. Regurgitation is a common occurrence, along with weight loss. On top of all of this, Kooper was skittish and lacked confidence with new or unusual situations, sounds, or people. Because of her megaesophagus, Kooper was placed in our Love For Life program. It took a year, but Kooper’s food and feeding regime was perfected. She had doubled her weight, was happy, and enjoyed visiting with the volunteers. She still was shy around unfamiliar things, but had made much improvement. It took a year, but happily Kooper is in her Love For Life foster home! Bonnie and her husband, Bob, specifically applied to foster Kooper. They have fostered and adopted other dogs with shyness and medical issues, so they were ready to muster up their patience and work with her. It hasn’t been an easy transition for any of them, as Kooper’s insecurities have played a larger role in her settling in than her megaesophagus. We don’t know what Kooper endured the first year of her life, but the poor baby has no confidence. Fortunately, Bonnie and Bob are very patient souls and continue to work with Kooper. 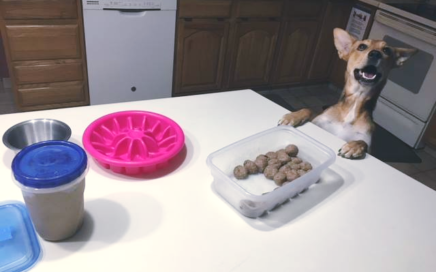 They see improvements every day as she learns to live with two other dogs and her people. She is happy, animated, eating well, playing well and adjusting. We are so grateful for our fosters and all they do to help normalize the damaged lives of our dogs. We couldn’t do what we do without you!